"What are 'crystal sets'," asked Junior. "Grandma would say that they are collections of glassware," laughed Grandad, "But to us they are boxes that could be used to receive radio signals. They are called 'crystal sets' because they use a crystal to make the radio signals into something that we can hear using headphones. The crystal is called a 'detector'." "Can you show me one?" asked Junior. "Why not?" replied Grandad. "They were made by everyone, in beautiful commercial cabinets and in awful home-made boxes. I made several, but only kept one that I built. It got a bit bashed and broken, so it doesn't really show things at all well. "Here it is, looking as though it's been trodden on, which it has!" Grandad showed Junior the set that he had made from bits of wood and brass, much of which had been filed to the right shape and size. "You can see the holder for the crystal, and the lever that works the cats-whisker, but the glass has broken and gone, and the tuning knob that should be at the end is missing. "I'll open it up, so that we can look inside," said Grandad. Junior watched as Grandad turned the set upside down in his hand and let a lot of bits fall into his palm. "This one uses a spring-loaded slider that can be moved along the tuning coil by a knob at the end which turns the threaded rod," he explained. "Many newer sets and almost all commercial sets use a variable condenser for tuning, but it's very hard to make one of those with a file!" Junior looked inside and saw two coils of wire. The one that was loose had a line of bare wire along it where the slider made contact. "Why two coils?" he asked. "The other one sets the right place in the band, so that the adjustable coil tunes by the right amount," he said. "If the whole lot was done with one coil, it would be a lot bigger and I wouln't have made it fit in that nice little box." Junior didn't rise to that one, but just said "Is that Meccano bits holding it all together, Grandad?" "Yes. Jolly useful stuff, Meccano!" replied Grandad. "Now Let's look at a commercially made set from 1920. 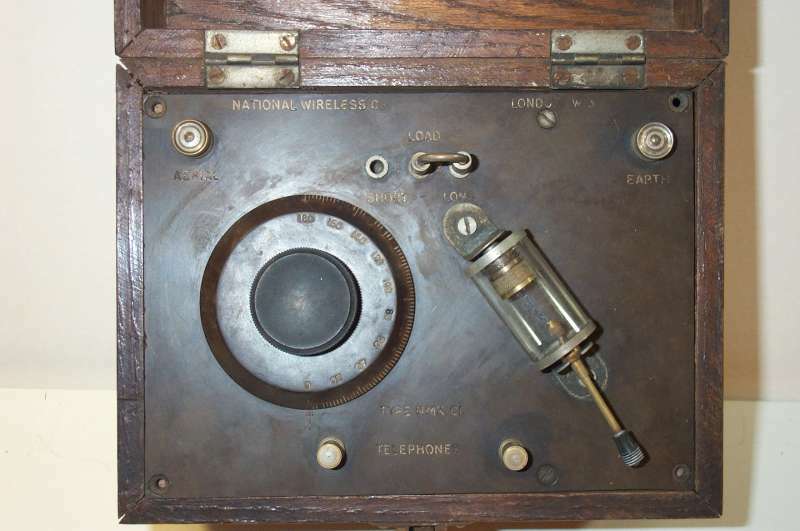 "This set was made by the 'National Wireless Company', of London W3. It is the model 'NMK CL'. This set uses the usual parts. "This has survived better than my home-made set. The lid has even protected the glass tube that sits over the crystal to protect it." "Why does it have a little handle sticking out at the end of the tube?" asked Junior. "Good question," said Grandad. "The little handle can be moved in and out, and waggled from side to side, if you catch hold of it - but do it very gently. When you move it, the little springy wire in the glass tube moves around. What you have to do is to let the end of the wire poke gently onto that lump of stuff at the other end of the tube. That's the crystal. When the wire pokes in a good place, the signals are made into a form that will drive the headphones, so that you can hear it. The wire is called a 'cat's whisker' because it looks a bit like one." "Can we look inside?" asked Junior. "Just like me," replied Grandad. "I always have to take things apart to see what's inside. Anyway, this is easy." He opened up the set and they looked at the underneath of the panel. 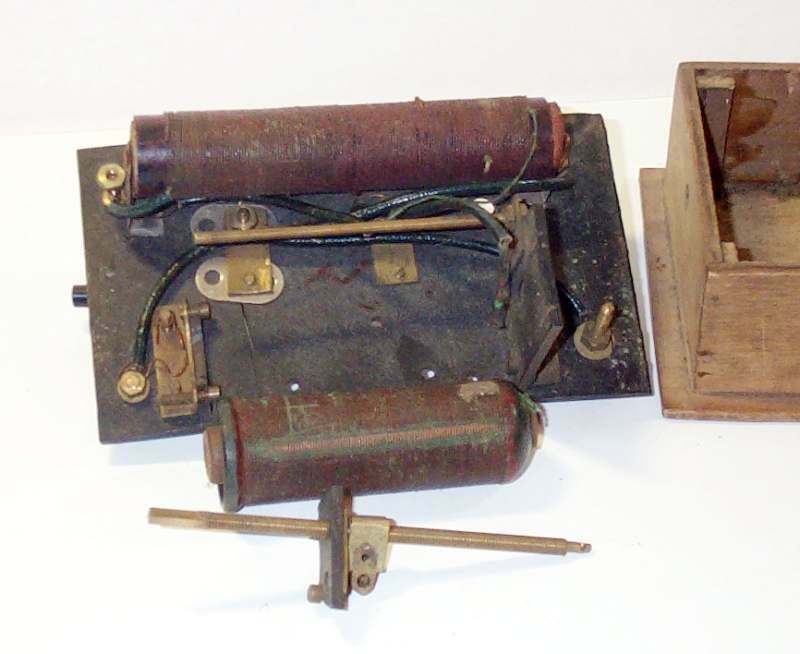 "The coil is called a 'tuning coil'. The other bit, called a 'tuning condenser', it does what the name suggests - it tunes in the station that you want to hear. The tuning condenser has a knob on it that varies the wavelength that gets received. 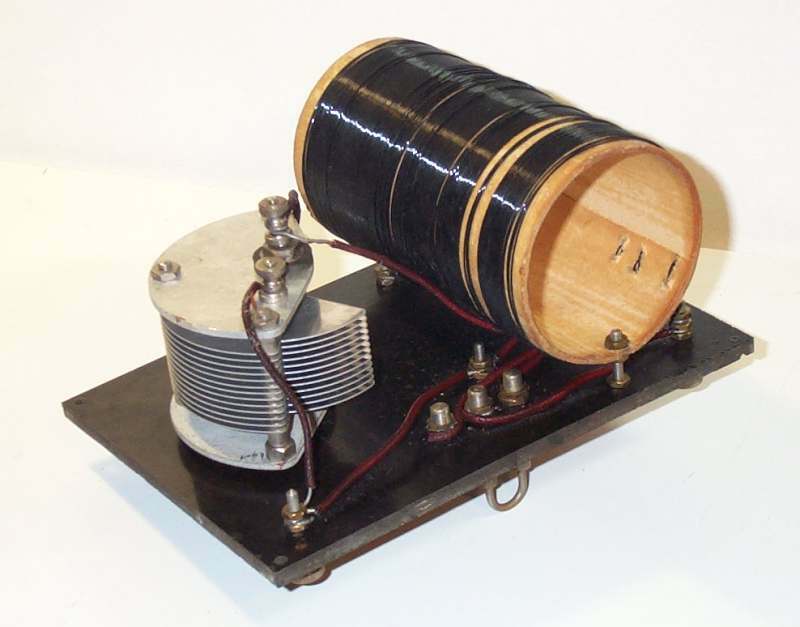 These days, the condenser would be called a capacitor instead." "Yes, I know that," said Junior impatiently. "Then what?" "Then this all connects to the crystal. That's it, there, in the glass tube on the top." Grandad put the panel back into the box and showed Junior the crystal in it's glass tube. "How does the crystal work?" asked Junior. "When the wire pokes in the right place," replied Grandad, "The tiny place where they touch has a special way of behaving. It will pass electricity one way but not the other. It is called a 'detector', because it helps to detect the radio signals. When it works right, the signals are made so that they will drive the headphones. "These days it is sometimes called a 'demodulator'. What it does is to sort of strip away the high frequency signal called the carrier, which is what the tuning circuit selects. What is left is the variation in level, known as the modulation. This is the sound signal that we want, to drive the headphones. "Without the crystal, nothing at all can be heard in the headphones. Even with the crystal, it is jolly difficult to get everything right! 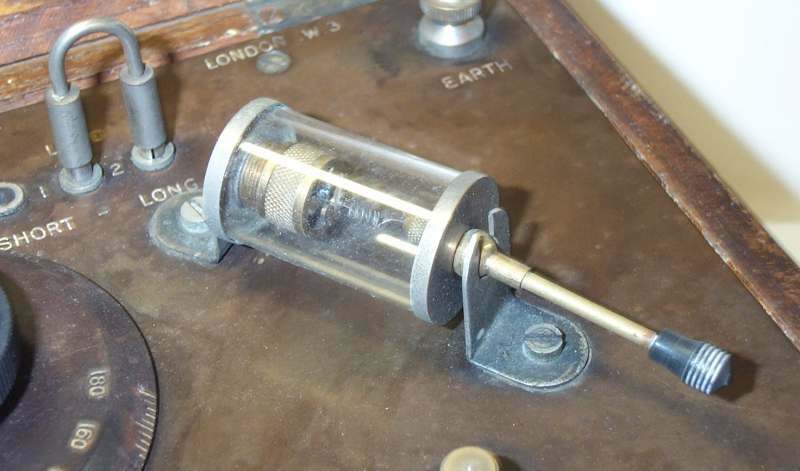 First of all, the tuning knob must be in a position where a station exists. Then the cat's whisker must be poking at a sensitive bit of crystal. Of course, a good aerial and earth connection are needed, to pick up the signal in the first place. When all those things are right, it works." "Golly," said Junior. "It all sounds very unlikely to work at all! Did people ever get it right?" Grandad laughed. "Yes," he said, "it was possible. "In later years, crystals permanently fitted into glass tubes could be bought. These were set at the factory to give the best performance and, as long as the thing didn't get broken, they stayed good. I played around with them on an old cheap crystal set that I bought. It was also good for experimenting with different coils." Grandad showed Junior the 'toy' crystal set that he had used by removing the original crystal. He could then connect his experimental circuits in place. "So what are an aerial and earth?" asked Junior. "An aerial is just a long bit of wire, as high above the ground as possible and as long as possible. It has to be outside to work well. An 'earth' is just that; a connection to the ground. It can be done by connecting to a water pipe, or by sticking a big copper rod in the ground and connecting to that. 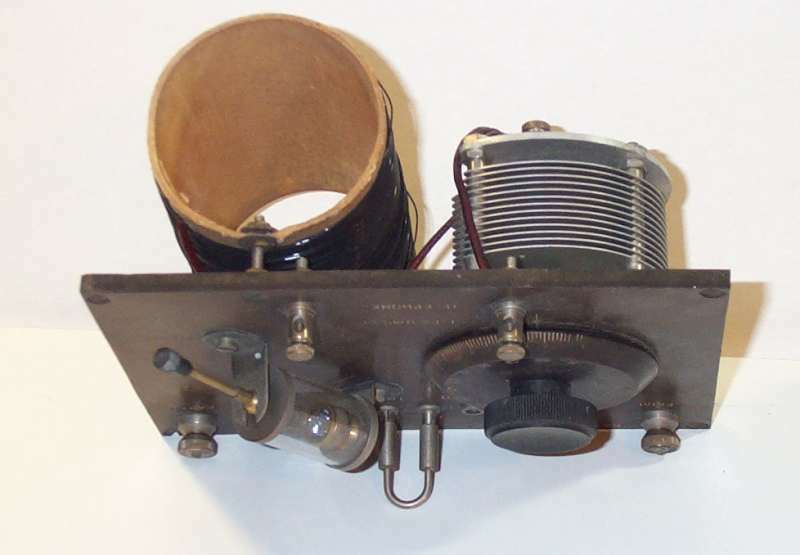 "In later years, there were special aerial kits sold that had coupling transformers at the top and bottom, and a screened wire between them. This reduced the crackles and noises made by electrical stuff in the house and in passing cars. It wasn't so much of a problem in the 'twenties, because people didn't have cars and vacuum cleaners." "Why are Aerials and earths needed?" asked Junior. 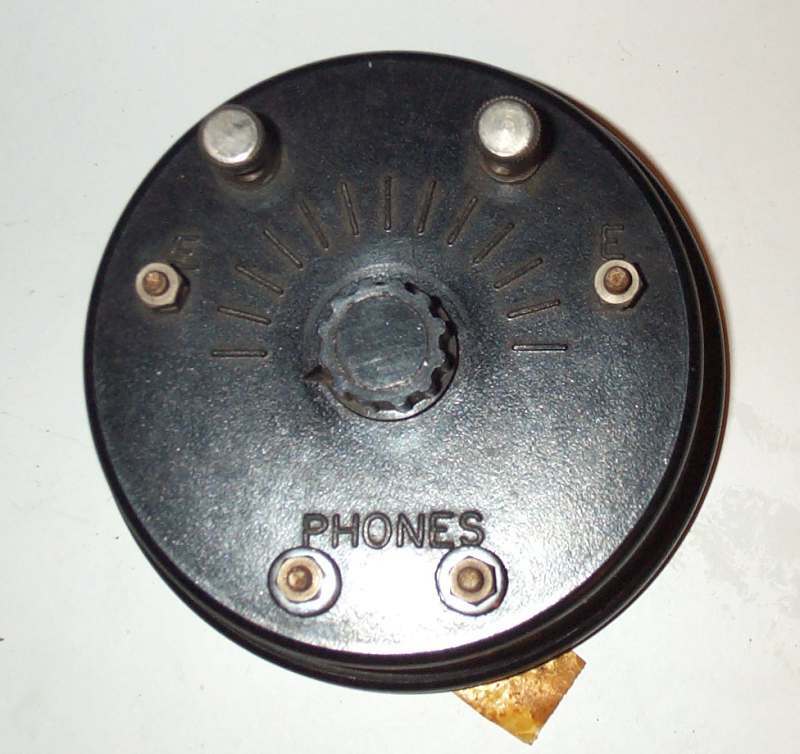 "My transistor radio doesn't need them." "That's right. 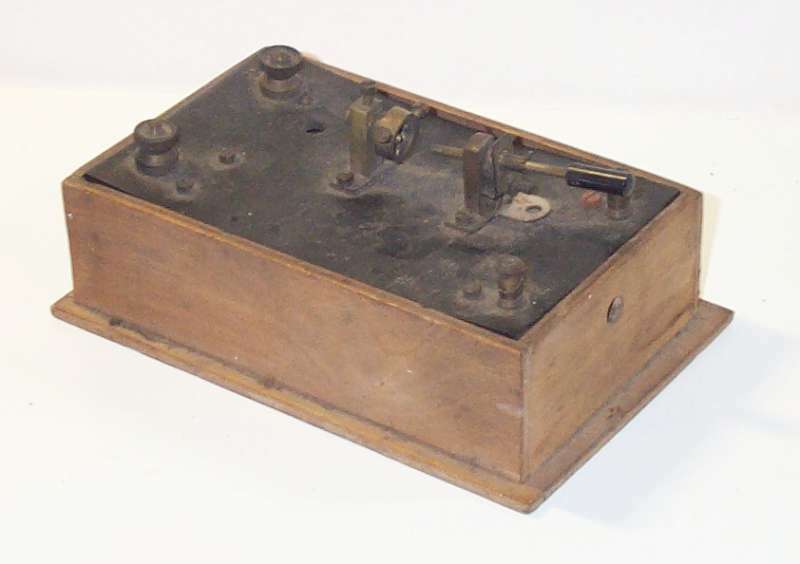 Your radio has a different sort of aerial that was invented later on," replied Grandad. 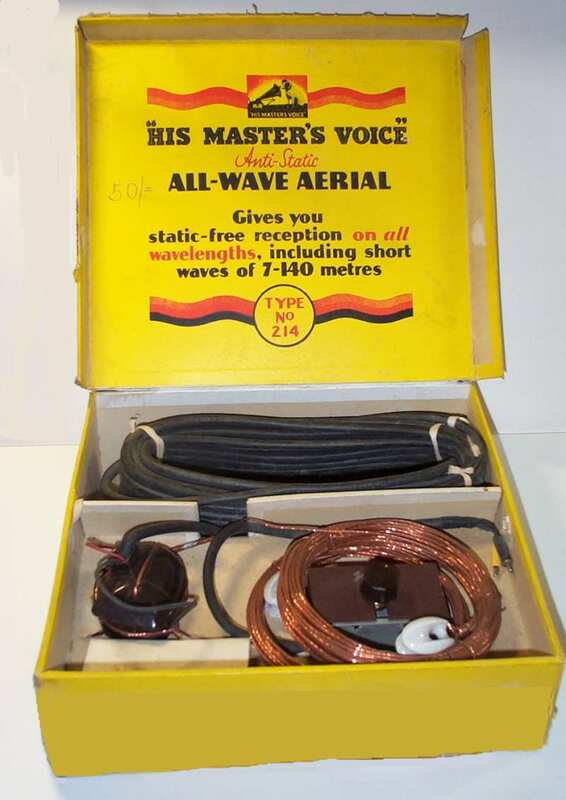 "For a crystal set, a big aerial and good earth are needed in order to grab as much of the radio signal as possible, otherwise you won't hear it." "Have you got a good aerial and earth, so that we can listen to the crystal set?" asked Junior. "Not in this house," replied Grandad. "Maybe I can fix it up for another time, and we'll se if we can make the set work." "Yes, please," answerd Junior, "I'd like that very much". "Maybe next time you come, then," said Grandad.